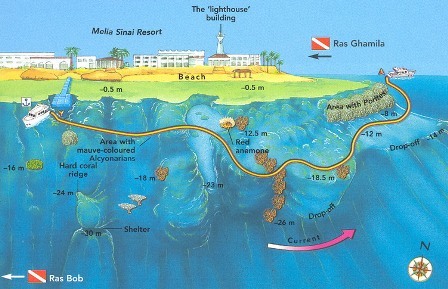 Ras Umm Sid is a Sharm El Sheikh Local dive sites located in the South part of the resort. A very nice hill that offers a great view on the Red Sea. The reef is a colorful wall that starts at 8 metres depth and it reach the deep blue , It is completely covered from many different kind of Soft Corals, Gorgonias and thousand of fish. 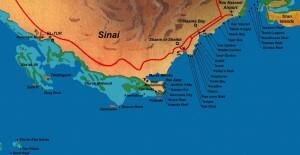 Ras Umm Sid dive site is one of the most beautiful Sharm El Sheikh Local dive sites. An abundant marine life is present in all the dive site and just few metres out in the blue giant Tunas and many Jackfish can be easily spotted. 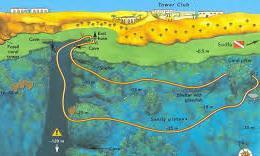 Current has directional unexpected changes expecially on the north part of the dive site where the corner is. During the Summer season, Ras Umm Sid dive site is a great observatory spot for Whale Sharks, White Tip Reef Shark and Hammerhead Sharks. 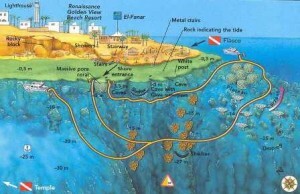 Tower Reef is located in the cental-south part of Sharm El Sheikh. The dive site has a vertical crack where the dive starts. The Crack continue to a depth of 130 metres. The crack exit is at approximately 20 metres, the corner offers a great marine life where Pelagic Fish are passing by, Giant Tunas, Mantas, Eagle Rays, Grey Sharks are common. The sandy area has many pinnacles full of marine life, you will easily see Glass Fish, Clown Fish and different Nudibranchs. 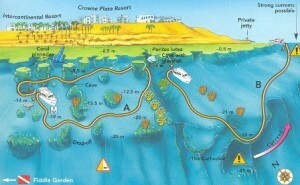 This dive site is recommended to Advanced divers and to all Technical Divers. Current is generally absent with a good visibility all year round. 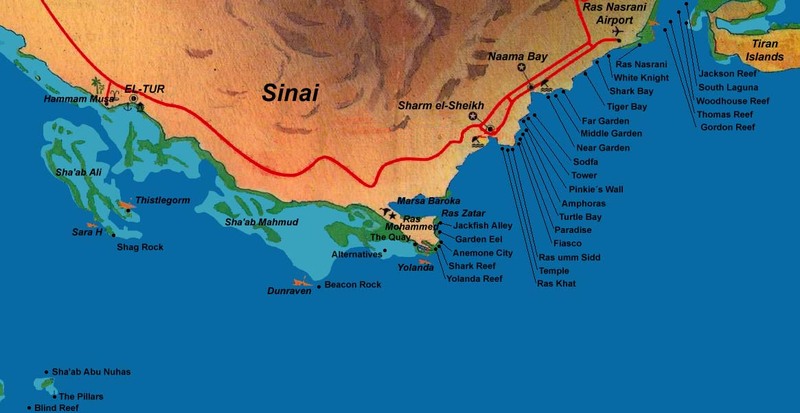 The Gardens are situated in Sharm El Sheikh Local dive sites central area, the dive site is composed on three different gardens not far from each other. Near Garden is the first garden and has a sandy bottom area where Turtles and Eagle Rays are easily spotted. The Garden of this dive site has many Fire Corals, Soft Corals and Gorgonias. Fiddle Garden is the second dive site with many pinnacles ending close to the reef wall where the dive starts. Leopard Sharks, White Tip Reef Sharks are common in this dive site. Far Garden is the last one famos for his ‘Cathedral‘ at approximately 35 metres depth. The Cathedral is an accessible crack full of Gorgonias and Soft Corals. Current and visibility varies according to the season. 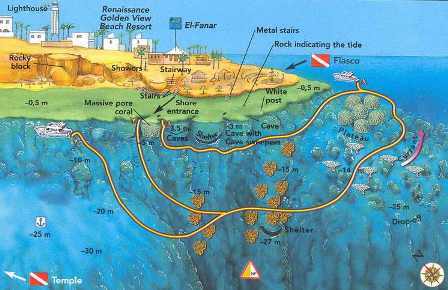 Ras Nasrani is one of the last Sharm El Sheikh Local dive sites, situated in the North part right in front of The Straits of Tiran. Ras Nasrani capture divers attention for his deep blue water. Soft Corals and Gorgonias are full of life and different colors. Great sightings frequently happens in this dive site such as Hammerhead Sharks, White Tip Reef Sharks, Mantas and Giant Tunas. 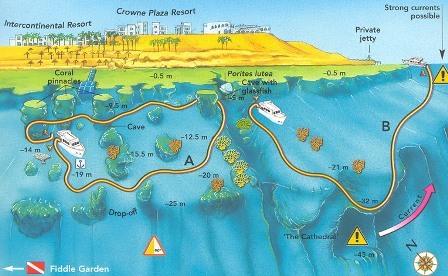 Current can be strong especially at the end of the dive site close to the corner. Visibility is generally good all year round.